Shepton Mallet's Tyson Pollard made a scintillating start to the new season, scoring four goals inside the opening half hour during his sides' 5-0 triumph over Shortwood United. The hosts were three goals up after just 12 minutes, with Joe Morgan adding to Pollard's early double. Morgan then won a penalty which was converted by Pollard, with the frontman then adding his fourth to complete the scoring in the 29th minute. Another forward to enjoy his day in front of goal was Ben Bament, with the new Bitton signing scoring in either half to secure a 2-0 win over Clevedon Town. Another side to claim a 2-0 win was Bridport, with Chris McGrath and debutant James Cox each scoring late during their defeat of Chipping Sodbury Town. 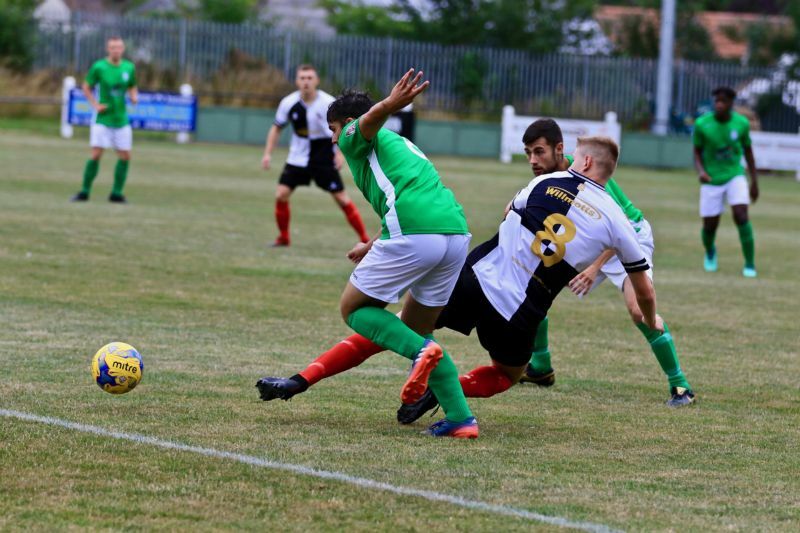 The promoted trio all enjoyed success on the opening day, with Western League new boys Plymouth Parkway coming from behind to beat Odd Down 2-1. The visitors from Bath capitalised on a red card to home skipper Shane Krac and went ahead inside the opening minute of the second half. The Parkway managed to get back on level terms midway through the second half thanks to Adam Carter, with Ben Joyce then scoring two minutes later to complete the impressive turnaround. Last season's First Division champs Westbury United were also forced to come from behind during their 3-1 victory over Wellington for whom Josh Wadham had given an 11th minute lead. Jamie Jordan struck the equaliser just prior to half-time, with Dan Kovacs then striking twice after the break to hand Westbury all three points against their opponents who finished the fixture with nine-men. Roman Glass St George were the third of the promoted sides to finish in the winner's circle on opening day, with Ken Oni opening the scoring after just 45 seconds, before Joe Swift struck from outside the box to hand them a 2-0 win away at Hallen. In the Devon derby at Homers Heath, Brad Ausden swept home the only goal of the game ten minutes after the interval to give Willand Rovers a 1-0 victory away at Buckland Athletic. Ricky Chandler's 35th minute leveller secured a 1-1 draw for Brislington away at Cadbury Heath, while Tyler Sibbick and an own-goal handed Bradford Town a winning start to their campaign as they beat Cribbs 2-0. Keynsham Town got things kick-started on Friday evening, scoring four times after the break to complete a 5-0 win over Bishop Sutton. Craig Wilson claimed the first goal of the season just before half-time, with last season’s top scorer Matt Brown doubling the K’s advantage in the early stages of the second half. A bullet header from Wilson made it 3-0 20 minutes from time, before goals from Adey Harvey and Nathan Curnock finished things off in the closing stages. The following day, Cheddar made a big statement down at Nursteed Road, scoring twice in either half to claim a 4-0 win over Devizes Town. After going ahead through Sam King early on, the Cheesemen doubled their lead just before the break through Stephen Pennington, with Reece Ferguson and Kristian Bell adding further goals in the second half. Ashton & Backwell United were another side to claim three points away from home, with Courtney Hepper and Joel Bishop each getting on the scoresheet during their 2-1 victory against Wells City. Liam Gale made a strong start to the season for Oldland Abbotonians, with the strike notching both goals during his side’s 2-1 win away at Portishead Town. An excellent first half showing from Chard Town helped them to secure a comfortable 3-0 win at home to Longwell Green Sports. Chard’s three goals all came within the space of 20 first half minutes, with Kieran Bailey and Steve Friend adding to Andy Holmes opener at the Dening Sports Field. A solitary goal from Dan King handed Corsham Town a 1-0 win away at Welton Rovers, with Chippenham Park defeating Warminster Town by the same scoreline to open their campaign with a win. Matt Hudson’s long range effort was the difference between the sides at Bremhill View where Calne Town defeated Bristol Telephones 1-0, while goals from Luke Woodland and Toby Cole saw Wincanton Town claim a 2-1 win away at Radstock Town. Following a 19th placed finish last season, Sherborne Town showed signs of having a better time of things in 2018/19 after beating Bishops Lydeard 2-0. The opening goal went to Tim Trevett who capitalised on a mistake in the visitors defence, with Sherborne’s leading marksman from last season Harry Vandervell wrapping things up in second half stoppage time with his first of the new campaign.